A nice closeup shot of an eagle owl with staring yellow eyes, by Tennessee nature photographer Byron Jorjorian. 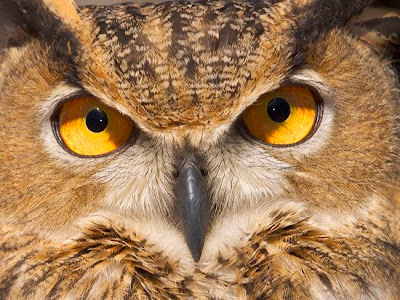 Turns out owls are rather stupid for birds their size, despite their reputation for being wise, ostensibly because those amazing eyes take up most of the room in their skulls. ADDENDUM: My Ph.D. ornithologist friend from the University of Oregon can't confirm or deny the above contention, so maybe it should be considered as suspect as the "wisdom" cliché it counters. Perhaps it's flat "mouth" that their feathers create make it look like a dispassionate expression, which we associate with wisdom. Thanks for making us aware of this guy's site! This is more than just your run-of-the-mill nature photos. Dumb predators don't last too long in the wild.